The Hispaniolan Solenodon, Solenodon paradoxus, is one of the rarest mammals on Earth. And it's poisonous. Solenodons are an evolutionarily distinct family of insectivores which live primarily on Caribbean islands. 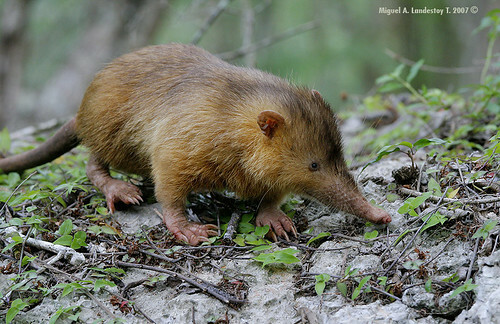 There are only two living species in the family Solenodontidae (the Cuban and the Hispaniolan Solenodons), and they are among the rarest and most elusive mammals on the planet. Solenodons have been driven to near extinction due mainly to the introduction of predators like cats, dogs, and mongooses into their habitat. Solenodons are elusive not only because they are rare but also because they are nocturnal burrowing animals, spending most of the day hiding in burrows, logs, and other nooks and crannies. Poisonous Fangs – Solenodons are the only known mammal able to deliver venom through fangs. Venom is produced in modified salivary glands and is then released through grooves in the second lower incisors (“solenodon” comes from the Greek for “grooved tooth”). Though the poison may prove useful in killing the solenodon’s prey, such as earthworms, insects, and other small animals, it does not seem to be very effective in combating predators. 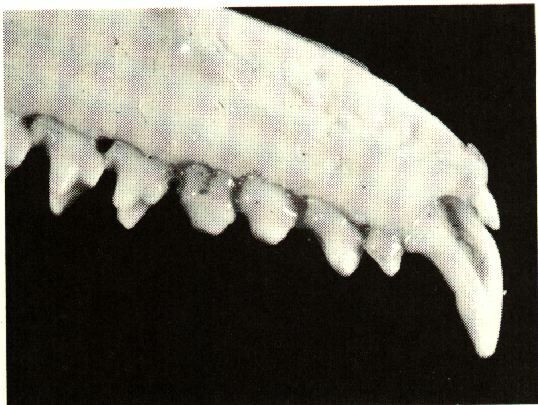 Venom flows through the groove in the large second lower incisors to deliver a poisonous bite. Glands – Besides their modified salivary glands, solenodons also have glands in the armpits and groin which release a musky, goat-like smell. Nose – The anatomy of the solenodon’s long nose is actually very distinct. The solenodon has a unique bone, called the os proboscis, which forms a ball-and-socket joint with the base of the nose and helps the solenodon control its nose movements. The structure of the nose supports a very long cartiliginous snout, which, given its length and mobility, can easily probe small nooks and crevices for bugs. The video of a solenodon below shows just how large its nose is in comparison to its body.Vodpod videos no longer available. Teats – Female solenodons have only two teats, which are positioned at the rear of the body near the buttocks. Wikipedia claims that this allows baby solenodons to trail their mothers during the first few weeks of their lives. This actually makes sense, because solenodons live in dark burrows where it would probably be easy for a solenodon to lose an errant baby. Incompetence at Living – Due to their status as a top predator in Cuba and Hispaniola prior to the introduction of other animals by Europeans, solenodons possess a host of traits that seem to doom them to extinction. History of Extinction – Solenodon fossils dating back 30 million years have been found in North America. However, their range has been reduced to just two Caribbean islands, where they have probably been able to survive mainly due to the small number of predators. At least one species of solenodon died out shortly after the arrival of Europeans on Hispaniola. Wobbly Walking – Solenodons are well-known for their inability to walk in a straight path, and they reportedly trip and tumble when they try to run. Dealing with Predators – Though solenodons have large claws and are known to fiercely attack their prey, when pursued they stop in their tracks and hide their heads, allowing predators to easily kill them. Slow Rate of Breeding – Female solenodons have a maximum of two litters per year with a litter size of 1-3 babies. This is exceptionally slow compared to similar animals. Additionally, females have only two teats, so even if they have three babies, one will probably die from starvation. The Cuban Solenodon, Solenodon cubanus, is not the most photogenic of mammals. Solenodon [Ryerson University] – this website goes into great detail about why solenodons are doomed to extinction.